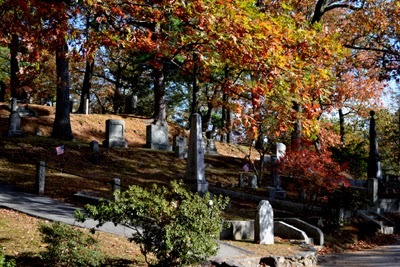 Finding ourselves at a Saturday doctor’s appointment in Concord, Massachusetts, we took the opportunity of stopping by one of my favorite “haunts”, Sleepy Hollow Cemetery. There is an Author’s Ridge there where the Alcotts, Hawthornes, Emersons and Thoreaus are all buried. 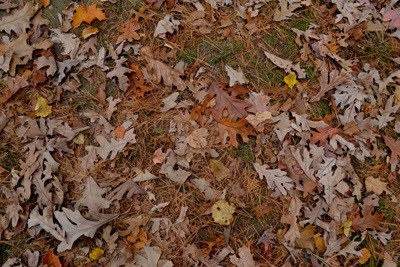 The fall season added much to this scenic landmark. 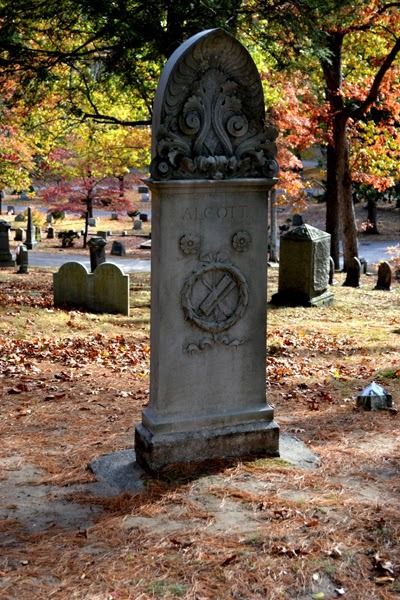 We found this site years ago as we visited the Alcott house. Louisa May Alcott is among my very favorite authors. Of course, Little Women, is a story that no young girl should miss reading. Doesn't everyone fall in love with Jo March, the character that most resembled Louisa in real life. Her sisters were dear too as was Marmee, their mother. Jo is the tomboy who scorches her dress standing too close to an open fire place, stains her gloves and can hardly be taken out in public for her unrefined personality and sadly turns down the beloved boy next door, Laurie and marries instead a strange older professor, that disappoints all young readers, but later delights senior readers, that appreciate that mature is a good characteristic in a man. I then went on to read Little Men, Jo’s Boys, and Eight Cousins. I hadn't a clue that there were more serious writings of her life as a nurse in Hospital Sketches, as well as her diary. She is a real heroine figure to me. She lived by her pen and mind, helping her family scrape by financially by selling her stories and whatever other talents she could market. It is only recently that it has been discovered that she wrote less-classical tales written under a pen name, lest she shame her good character as they reveal the wilder side of the “Jo” character within Louisa. These stories are filled with damsels in distress and some real villains. There is even one about a clever and evil woman who steals the heart of everyone, getting them to fight over her while she goes off and marries the senior master of the house, the one with all the money, using her wily theatrical talents and clever brain pushing all the others out of their inheritances! 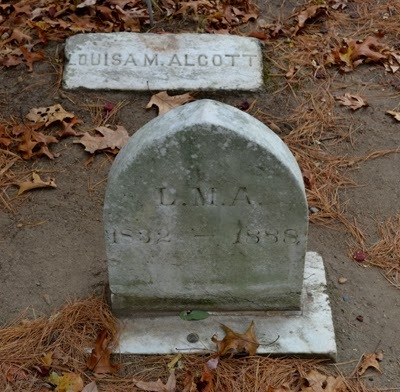 What wasn't there to love about Louisa, and with it her neighbors and friends, Ralph Waldo Emerson, Nathaniel Hawthorne and Henry David Thoreau? It is sad to see that Walden Pond is now surrounded by residential living, hardly a place to seek to gain that sense of being at one with nature and finding oneself. 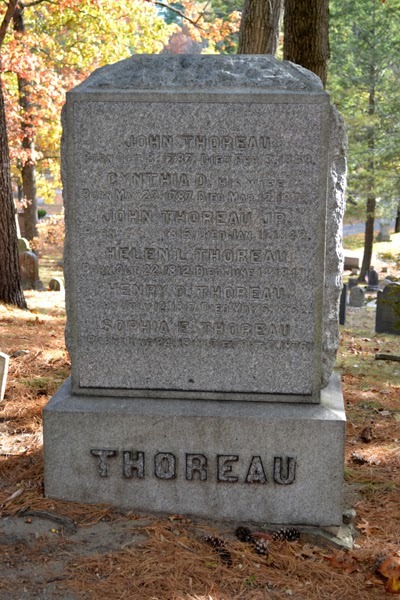 Still, as we strolled through the cemetery and took pictures, I couldn't help but listen to one woman’s rendition of this group of progressive thinkers of their day, the Transcendentalists. She described them as hospitable enough, but likely the sort that in today’s world would only be useful in being leaders of literary discussion groups, but impractical and definitely not the sort to have good jobs or be responsible. 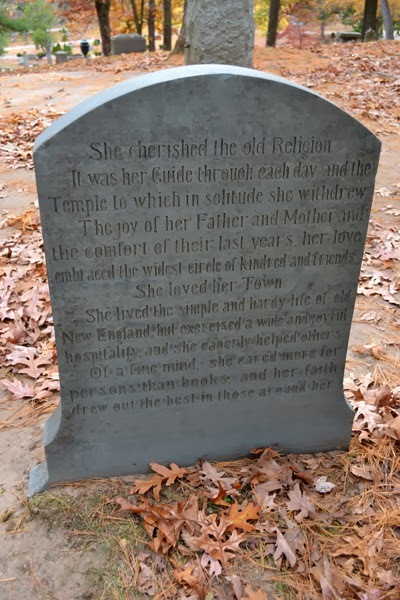 I wanted to step up to her and remind her that she was standing on Hallowed ground, being the cemetery where my dear and kindred-spirited friend was buried. I was a person of responsible jobs and now find I fall into the other category and like myself better now than before. 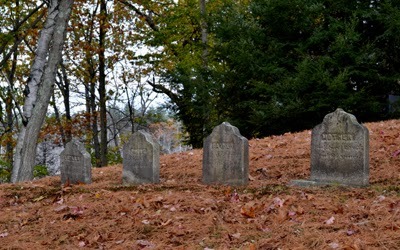 All of the family plots had chain railings that were no longer effectively keeping people off the graves, except for the Hawthorns. 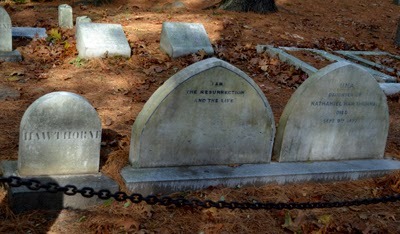 The chain surrounding their graves was very heavy and had even had been padlocked together. 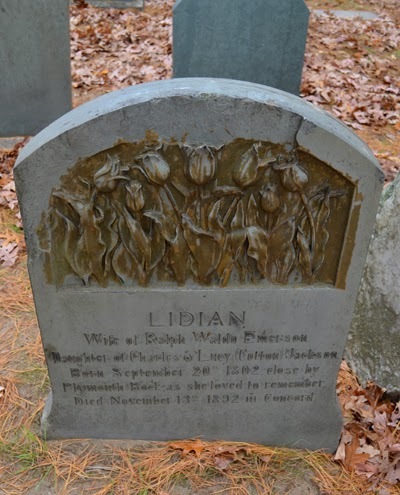 It spoke loudly to stay out of the family plot and not to tread on them, though the chain was still so low to the ground that it could be simply stepped over. The woman’s comment was most interesting, as these thinkers and writers are the very foundation of American literature and are still being read in schools today and certainly earned respect among the writers and scholars of their day as well as ours. I couldn't help but wonder what will this arrogant woman’s legacy be when she is gone, though I loved touring the grave sites of the obscure as well. 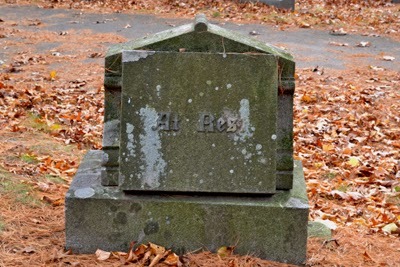 My husband found and photographed a stone that that simply read “At Rest”, for the head stone had likely been damaged and the foot stone was now set in front of the headstone. 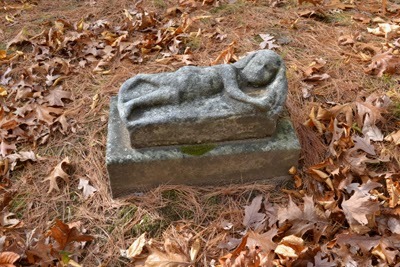 He also found the memorial tomb of a baby whose statue is so worn that it is nameless now but still a beautiful and loving tribute to the dear little one that now, no doubt, has been reunited with its parents for another lifetime. 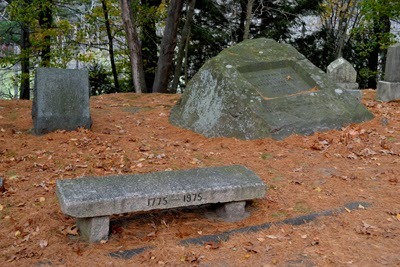 Emerson’s wife and daughter' tombstones were covered with a flowery rendition of their lives carefully scripted. 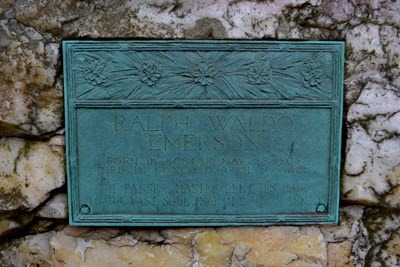 Their talents, more simple, needed more words that the one line epitaph on Emerson plaque on his large stone. 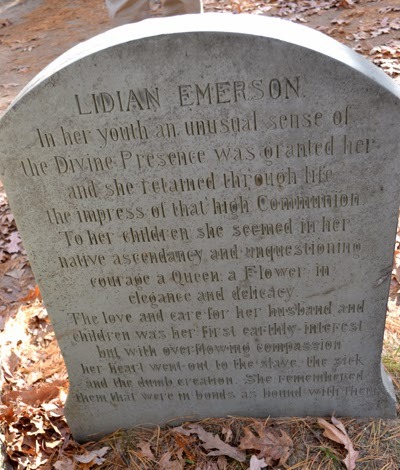 Lidian Emerson, Ralph's wife's stone read "In her youth an unusual sense of the Diving Presence was granted her and she retain through her life the impress of that High Communion. To her children she seemed in her nature ascendancy and unquestioning courage a Queen: a Flower in elegance and delicacy. The love and care of her husband and children was her first earthly intent, but with overflowing compassion her heart went out tot he slave, the sick and the dumb creation. She remembered them that were in bonds as bound with them." 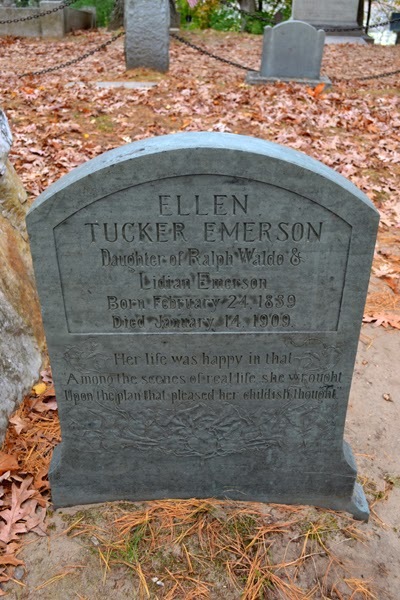 Ellen Tucker Emerson's epitaph read, "Her life was happy in that among the scenes of real life she wrought upon the plan that pleased her childish thought. She cherished the old Religion. It was her guide through each day and the temple to which in solitude she withdrew. The joy of her Father and Mother and the comfort of their last years, her love embraced the widest circle of kindred and friend. she loved her Town. She lived the simple and hardy life of old New England, but exercised a wide and joyful hospitality and she eagerly helped others. Of a find mind, she cared more for persons than book and her faith drew out the best in those around her." Aren't they beautiful, though it did make me wonder about his daughter's child-like mind and not being into books, though her father penned volumes. Was she of limited ability, but loved all the same and isn't it interesting that families seem to often be a rather unmatched group. Her father being an intellect and his daughter not?And his wife like an elegant and delicate flower that communed with God? It speaks of the life in those days, not so easily taken for granted and definitely valued. And their loving tributes so different to our politically correct language of today, embracing unique differences, and definitely kinder. I liked their tributes to those they loved, finding the good in everyone and accepting and loving them just the way they were and carefully and poetically choosing the right words for the world to remember them by. 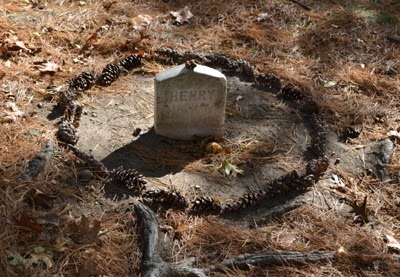 Cemeteries can tell us a lot and help us grasp as well, that we are here, but for a short time. I always have to ask myself when I stroll through one, “Am making the most of my short life here on earth? What will be remembered about me?” I think I have some serious work to do in that department, lest my epitaph read, "a recluse that loved to sew" or "disappointed in her careers, she closed herself off from the world and communed with Zeldie her cat" or "Wanting to be hospitable but worried about her messy house", or "loving and stingy but kind and proud of being thickly dense in bones and brain?" And I wondered if I should write my own epitaph, lest my stone read just “Mother” or “Jane, Daughter of George and Mary, Wife of Tom, Mother of Hannah and Sarah Kate, Maker of pincushions”...still what is so bad about that?,,,,perhaps a big stone could be purchased and more engraving added, “once a nurse and teacher and died, bravely and courageously, a willing guinea pig for medical science to discover a new cure for Lyme Disease”. Will my kids and husband add a flowery note about their loving admiration, and bit of grief without me? Consideration needs to be given perhaps to the size of the stone to keep me in my place and not let me wander?....Lots to think about for sure, especially near Halloween and All Saints Day. We are all, after all, special saints and most of what will be written will be penned in hearts versus stones, and if not, I'd best get to saving so I can get my last words scripted carefully for future generations to ponder.